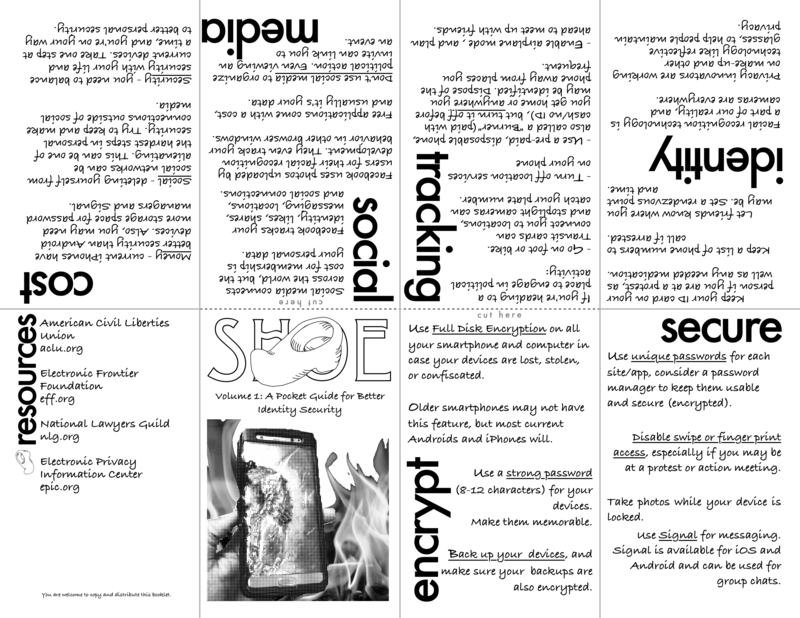 I’m going on a social media diet. Or a media diet. I realized I was in a cycle of misery, where actually, my life is pretty great, especially compared to where it’s been, and I find ways to feel miserable and ignore the things that give me all those good feelings. It’s been like this since last year, and after my terrified sobbing fit the night of the Presidential election, I’ve been engaging in a self-sabotaging torture by keeping my awake-self as aware as possible of the minute-by-minute pain and agony, current and to come. I tell myself that my privilege means I need to be aware, but it’s not like I’m not aware, or even like I’ll necessarily forget (though that’s a risk), it’s that by not giving myself time to step away and see the world I’m in, in the here and now, and try to find peace within that, I’m making myself fairly useless, and engaging in other self-defeating behaviors. I realized this past week or so that I was in this cycle of keeping myself aware through Twitter and news apps, and then carb loading – not because they were delicious and worthy carbs, but because they were there. I realized I was getting in a habitual cycle, I’d scroll my feed, start to feel terrible about everything (the world, myself), and then reach for the nearest thing that could make me feel, if briefly, less horrified. I heard a friend talk about the “Tr*mp Twenty” – and I’ve probably gained that much. It wouldn’t bother me so much if it wasn’t for the fact I’ve also let Instagram’s beauty (even “body positive” beauty) tell me what it is to be pretty and attractive. My friend Marika recently wrote about her own situation with social media, and it really resonated with me. I don’t want to retreat into my privilege. I left Facebook a year ago (mostly because I hate the platform, and think they’re evil), but I’ve stayed on Twitter, dutifully reading the feeds of a variety of people ranging from Black Lives Matter activists, Democratic Socialists, Never Tr*mp Republicans, journalists on national and local beats, and artists and authors I admire. It’s all screaming, all the time – or it feels like that right now. Like the flames are rushing into our last sanctuary and it’s all we have left in the hopes that those in power will save us. It’s making me unwell. It’s also making me miss doing the things that I really value, like focus on my family’s well-being, beyond just the basics. There are books I want to read, words I need to write, drawings I need to draw. I’ve ended up with serious imposter syndrome that has kept me grounded for far too long, and I’ve been a social media addict since probably before the word was even invented. It’s time for me to unplug. I’m still working out what that exactly means, but for now, it means I’ve uninstalled apps on my phone, and installed a utility to block specific traffic at specific times to keep me more focused. Why am I giving companies like Twitter and Facebook/Instagram my data, my intellectual property, for their profit, and my misery? WHY? Why am I consenting to this? I just know I need to do something different, and spending two hours less on social media seems to be a good start. December 6, 2017 Jane E.
This past weekend I decided to go down to Portland for Rose City Comic Con. Admittedly, pop-culture cons are not usually my thing. I’ve stepped into Emerald City Comic Con a few times, and found it overwhelming, and mostly not my jam. I’m not a collector of things-that-just-sit-there, usually. I also am this cynic that is generally annoyed by the cults surrounding famous people. This goes back to my third-ever pop-culture convention, a Star Trek convention in the Cincinnati area around 1990, where I was in line to get Marina Sirtis’s autograph, and the men around me were chatting about following her from con to con – all the way to Germany, even. It creeped me out, and stuck with me to the point that I was soured on pop-culture cons for a long time. I mean, the whole reason I was in line to get her autograph was the age-old story of a girl finding a character that she looks up to as a strong, female character – and here these guys were totally creeping on her. And I know from my Twitter feed that this kind of stuff hasn’t changed. So the first thing I do once I get my badge is go to the show floor and end up right outside the line for Peter Capaldi. 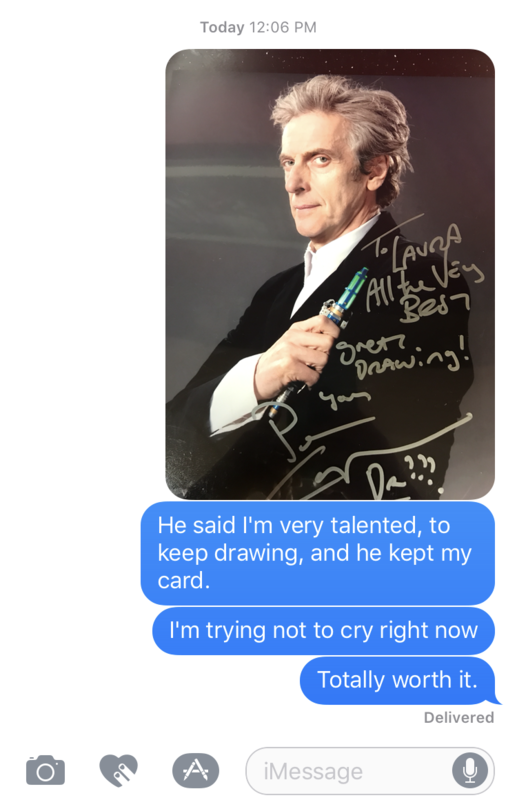 I didn’t quite have the cash to blow on a photo with Mr. Capaldi, and I wasn’t sure I could stomach the $100 for an autograph, but I was there, and suddenly realized that $100 felt like a small price to pay to get to meet someone that inspired my first-ever cosplay, and my first (as an adult) fan art. I came to the con wearing my Peter Capaldi 12th Doctor shirt, which was the first shirt I could find to buy once he became the Doctor. I had to stop kidding myself, I’m a fan, and this is why people come to these cons. The queue was long, and I chuckled to myself at some of my queue-mates inability to queue, thought about the British love of queues, and kindly helped orient some newer-to-con folks in the queue. The girl in front of me was literally squeeing. I played on my phone, a MiniMoo card in hand with a photo of the Doctor Who fan art on it, while I waited to be within earshot of the signing table. Peter Capaldi’s face lights up when he talks to children – he seems to want to put them immediately at ease, and has a patience I’ve grown to appreciate after dealing with my own small beings. Getting through the line, and in front of him, I went straight from “I’m going to be aloof and get his autograph after saying I love his work” to “let me stand here in a shirt with your face on it while showing you a picture of me dressed like you and a photo of a piece of art that I drew of you and can I have your autograph?” in mere seconds. He looked at the little card, and asked, “Is this in pencil?” and proceeded to complement me on it, and then pulled the card toward himself, after asking if he could keep it. He told me to keep drawing, which if I could somehow tattoo on my brainmeat to forever remember, I would. Somedays I just don’t feel like my brain and hand connect to create what I want – but the drawing of I did of him was a good session, and he reminded me that yes, I can draw. He also said to take care of myself, which immediately made me feel self-conscious, as if my tendency to not self-care was all over my face. Either way, if he saw that or not, I believe he meant every word. I started sobbing as I left the line, because 1. he’s incredibly kind and generous, and 2. my spirit needed that. That was my first two hours – and the rest of the con was filled with various notables. I was able to finally say thank you to Jen Bartell, for putting her work and her process out there, and inspiring me with her beautiful drawings. I spent quality time with another friend and creator who I don’t get to see nearly as much. 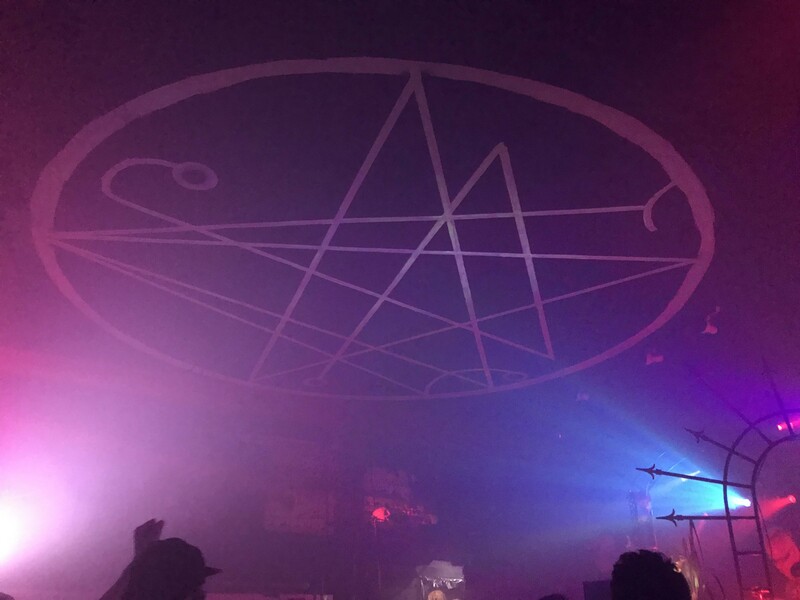 I ran into a con-friend who convinced me to go to Lovecraft Bar, which is actually themed as such. I ran into another con-friend too briefly the next morning. I dropped some cash on Niobe – she is life, bought a smutty comic from CrazedPixel, toured some breweries in Vancouver, WA, ate cookies for lunch, drank way too much coffee (after way too much vodka the night before), and managed to get home mostly intact. Oh, and just remembered a fun random – when I was waiting for the Doctor Who panel, I sat in the previous panel that had Ming Chen on the stage. For the life of me, I had no idea who he was, but knew he sounded familiar, and like so many things, I was wondering if I would care. It turns out that he was familiar because back in the late 90’s I was a big Kevin Smith fan, and on my early days on the Internet, I frequented his fansite that eventually rolled over into Kevin Smith’s official site. I haven’t kept up with Kevin Smith fandom, as that the last movie I really cared about of his was *maybe* Dogma, but probably the Clerks Animated Series. I did, however, go to Red Bank, NJ back in the day – and I have visited the Stash, and have a pic of Walt Flanagan that I took when I visited (circa 1997). This was in the original location. So, oddly enough, I had a time to kind of geek-out at something I loved a lot when I was in college. All in all, an exhausting, but fun weekend. Now, to get back to work. My site’s focus is more on illustration, and really is to focus me more on working towards my own goals. It’s easy for me to get distracted, and I’m hoping having a sense of purpose will help me get where I’d like to be. I’m taking an extroversion break for awhile, as that between being bombarded with houseguests and mandatory merriment, plus a huge family gathering on the East Coast, I’m just about tapped out. Also, if you’re needing illustration, let me know. I’m interested in taking on the challenge. 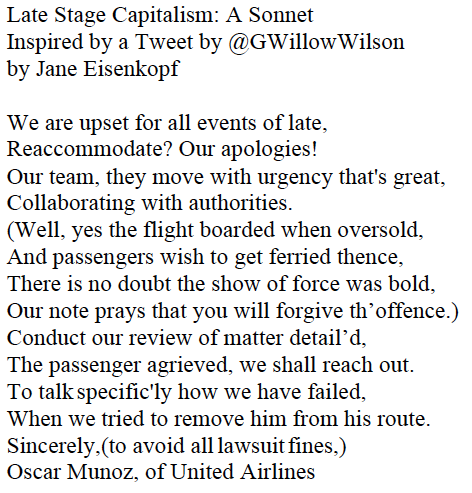 I wrote a sonnet, because a Tweet by G. Willow Wilson inspired me to. Hi! I’ve made a few tie-dyes this past weekend, and I’d like to sell you one and give the profits to Planned Parenthood! The shirts in this batch are all Unisex Medium, and $27 shipping included. If this works out, subsequent batches will hopefully cost less in materials and shipping, and have more profits go to the charity. Just contact me if you want one, and we’ll work out the details.